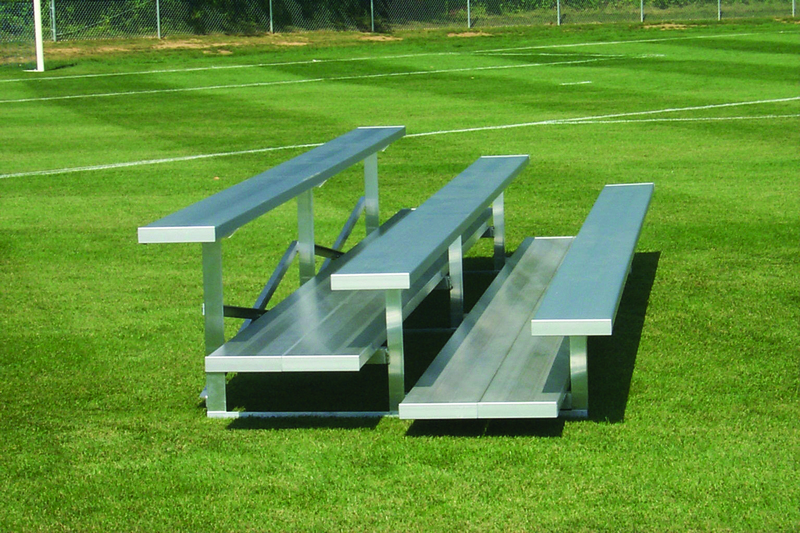 Below is a list of commonly used terms related to bleacher seating specifications. “Single Foot Plank” is a term used to describe (1) 2"x10” mill finish aluminum foot plank per row to rest your feet on when seated. “Double Foot Plank” is a term used to describe (2) 2"x10” mill finish aluminum foot planks per row to rest your feet on when seated. “Riser Plank” is a term used to describe a “mill finish” aluminum plank that is mounted vertically under the seat and behind your feet to close the opening to meet building and safety codes. “Rise” The vertical measure from the top of a bleacher seat to the top of the bleacher seat in the next row. “Run” The horizontal measure from the front of a bleacher seat to the front of the bleacher seat in the next row. Click to learn why are bleachers called bleachers. “Standard” suffix STD on the end of our model # refers to the bleacher system having single mill finish 2"x10"aluminum foot plank on rows 2- 3, double mill finish aluminum 2"x10” foot planks and mill finish aluminum 1"x6” riser plank on rows 4 & up, double mill finish aluminum 1"x6” riser plank on top row only. 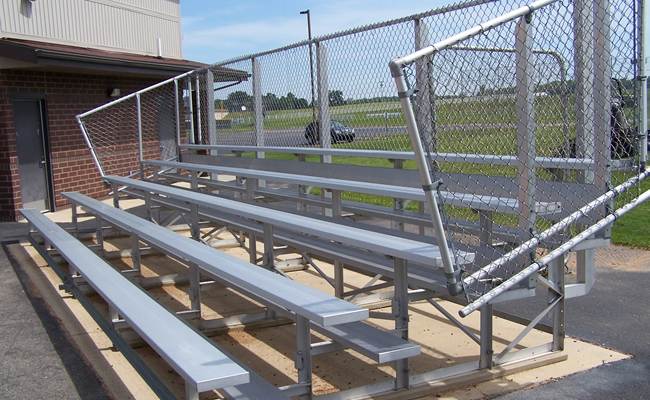 Guardrails are also included on 4 row bleachers, but not required or included on 4 row low rise bleachers. Guardrails are included on all systems with 5 rows of seating or more. “Preferred” suffix PRF on the end of our model # refers to the bleacher system having double mill finish aluminum 2"x10” foot plank on all rows and mill finish aluminum 1"x6” riser plank on rows 4 & up double mill finish aluminum 1"x6” riser plank on top row only. Guardrails are also included on 4 row bleachers, but not required or included on 4 row low rise bleachers. Guardrails are included on all systems with 5 rows of seating or more. “Deluxe” suffix DLX on the end of our model # refers to the bleacher system having double mill finish aluminum 2"x10” foot plank on all rows, mill finish aluminum 1"x6” riser plank on all rows double mill finish aluminum 1"x6” riser plank on top row only, and aisle with anodized aluminum handrail. Guardrails are also included on 4 row bleachers, but not required or included on 4 row low rise bleachers. Guardrails are included on all systems with 5 rows of seating or more. Whether you are building a new stadium or replacing old used bleachers we can help! 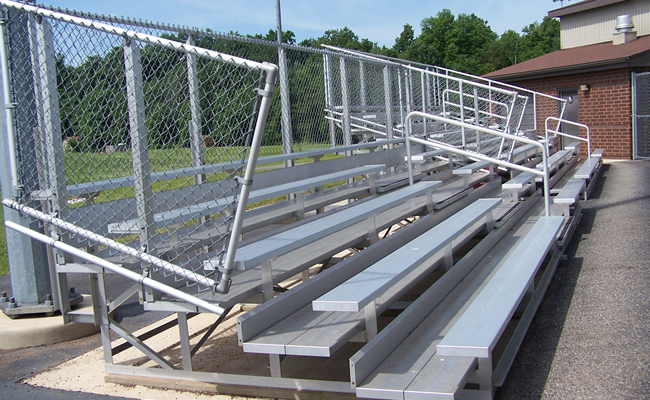 After all, we are the best in our industry and we are the trusted bleacher manufacturer.